Professor Genevieve LeBaron, SPERI co-director, presented findings from her ESRC project ‘The Global Business of Forced Labour‘ at a major international conference at Yale University earlier this month. 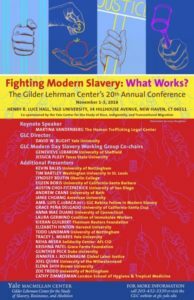 Professor LeBaron presented the findings at a conference entitled ‘Fighting Modern Slavery: What Works?’ hosted by the Gilder Lehrman Centre for the Study of Slavery, Resistance and Abolition at Yale University, 1-3 November 2018 in New Haven. Professor LeBaron also featured as a panelist on the final roundtable event of the weekend that addressed the central question ‘What works when it comes to fighting modern slavery?’. She offered insights from the Global Business of Forced Labour report relating to the ineffectiveness of prevailing solutions including ethical certification schemes and anti-slavery legislation, and findings that suggest the importance of living wages, working conditions and protections as key strategies to address the root causes of forced labour. The presentation was quoted in a headline news story by Kieran Guilbert of Thomson Reuters Foundation, ‘Major companies urged to stop telling anti-slavery ‘fairytales’’. 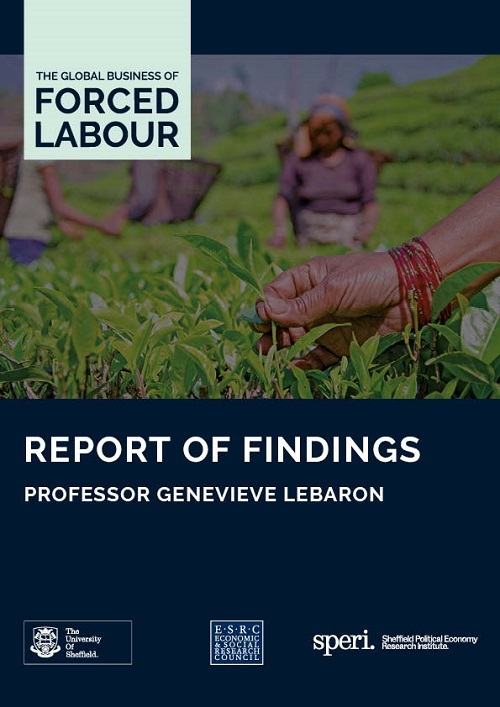 The two-year Global Business of Forced Labour study, led by Professor Genevieve LeBaron, investigated the business models of forced labour in global tea and cocoa supply chains. Forced labour is work brought about by physical, psychological or economic coercion. Extensive on-the-ground research with the cocoa industry in Ghana and the tea industry in India revealed agricultural workers are paid severely low wages and are routinely subjected to multiple forms of exploitation. The project involved in-depth interviews with more than 120 tea and cocoa workers, a survey of over 1,000 tea and cocoa workers from 22 tea plantations in India and 74 cocoa communities in Ghana, and over 100 interviews with business and government actors. The project’s Report of Findings and Policy Briefs were published in May 2018 and can be read here.